What is the wrist support AM-OSN-U-01/CCA? Stable scaphoid fracture should be immobilized for 8 weeks. In this case you should use our wrist brace AM-OSN-U-01/CCA with CCA system. Our wrist brace (AM-OSN-U-01/CCA) is created for active people and athletes with big risk of falling onto an hand. Our wrist brace is made of durable and breathable fabrics covered by durable leather. We used anatomic-shaped palm splint made of high quality of aluminum and covered by nylon and eco leather. On the dorsal side, there are two orthopedic splints also covered by nylon and eco leather. Special Velcro strap allows to fit the brace. Our compression system CCA, used in the brace, based on polyamide grommets, steel wires covered by plastic and knobs. 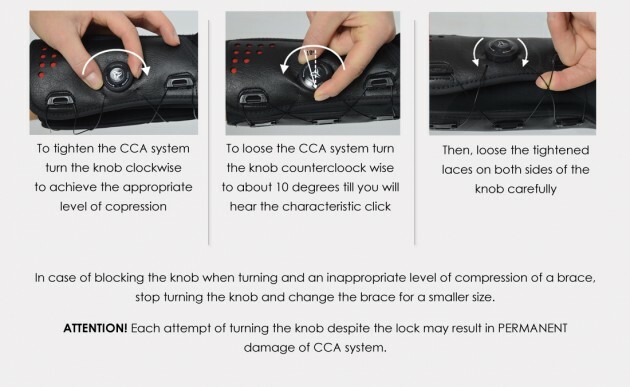 The CCA system provides excellent stabilization and perfect fitting. It’s very easy to use – you can adjust your required compression level even in the ski gloves! In order to fasten the brace, you only have to turn the knob the right (clockwise) to the required compression. When you want to put the brace off, you have only to turn the knob the left (counter- clockwise) to the “click” sound and loosen the wires. Our wrist brace PREHAB-TFCC (AM-OSN-U-10) is the best example of prevention in orthopaedic medicine. Athletes, placed at TFCC injury, should train with our brace what reduces the risk of injury to minimum. Wrist support made of ProFit – two layers fabric characterized by multidirectional elasticity, providing an excellent adjustment and comfortable fitting. Open wrist support was developed according to anatomic shape, providing stabilization on wrist and radiocarpal joint. Open wrist support was developed according to anatomic shape, providing stabilization on wrist and radiocarpal joint and thumb. The dislocation often occurs when athlete falls on their outstretched hand. After this, the patient feels pain and deformation is very visible. What’s more, the median nerve is compressed and it causes the numbness of I-III fingers. If you want to protect your wrist in sport training against the injury, check our new anatomic wrist brace AS-N.
AS-N-01 is anatomic-shaped open wrist brace with elastic circular strap. It’s available for right and left hand. 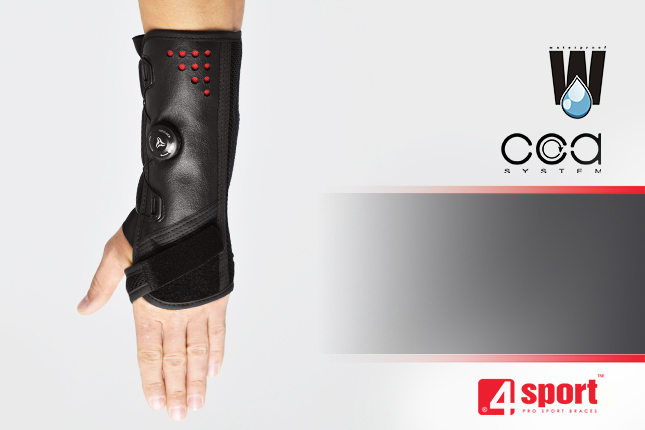 Wrist brace AS-N-01 is made of innovative, high-compressive and skin-friendly material called CottonPren. It’s soft and elastic what improves the compression. This fabric is made of comfort neoprene foam with polyester lining and internal elastic terry. The carpometacarpal joint of the thumb, called saddle joint, is one of the most movable joints in human body. Because of that, it is prone to injuries and conditions. The joint incorporates 5 movement in different planes: abduction and adduction, opposition and retrooposition and circumduction. Sport brace AS-N-02 is created for joint protection. It is made of anatomic glove and equipped with set of elastic straps, which are easy to attach and allow to set thumb in the required position. The thumb, mainly ulnar collateral ligaments (UCL) is very vulnerable to sprains because of its broad range of motion and mobility. The ligament is located at the base of the thumb and it stabilizes the metacarpophalangeal joint. Unfortunately, it’s enough to fall onto an outstretched hand with thumb abduction and after that immediately you can suffer from thumb sprain, sometimes connected with torn ligament. Boxer’s fracture is a common condition also in daily activities, not only in sport. It is a fracture at the neck of the fourth and fifth bones that forms the knuckles of a hand. It occurs when patient strikes an object with a closed fist.